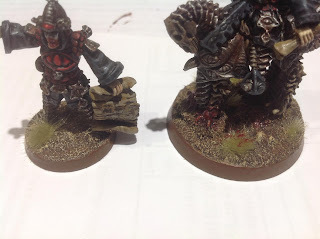 These past two months I have been playing in a game of Rogue Trader where the GM allowed us to play whatever we wanted. I decided that the only logical option for me would be a Necron Botanist, because there aren't enough nice gardens in the 41st millennium. Thus far we've spent more time harassing NPCs than actually getting on with any plot but we've certainly been having a good time! Though we aren't using miniatures in our campaign, I couldn't resist putting one together for my character. I managed to get the Necron Overlord from the Command Barge really cheap on eBay and then it was just a simple matter of reposing him and adding some robes and a seed bag in green stuff. 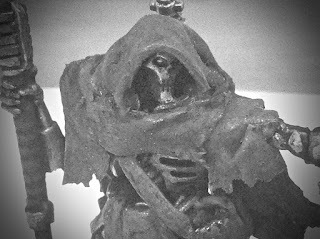 Though the miniature has a war scythe and a resurrection orb, I didn't think it would be too much of a stretch of the imagination for these to be a staff of light and an aetheroscope which is what my character is equipped with. Many millennia ago, Amontekh served at the court of the Nihilakh Dynasty as Lord-Gardner of the Grand Arboreum. Gifted in the botanical sciences he gladly accepted the bio-transference offered by the C'Tan so that he might live to see his work spread across the star and the gardens he planted grow to full maturity. His masterpiece was the so-called Grand Arboreum; an entire moon converted into a monstrous greenhouse for the cultivation of the rarest and most impressive of specimens the Necrontyr could gather. However, during the War in Heaven, the ancestors of the Eldar burned the Grand Arboreum to the ground, causing the extinction of many rare and wonderful plants that Amontekh had spent several lifetimes cultivating. With the destruction of his great greenhouses, Amontekh's rage was immense, yet even after the Necron victory over the Old Ones he felt only hollowness rather than the joy of vengeance. Nothing could replace the grandeur of the Grand Arboreum, and clad now in bodies fo necrodermis, his brethren cared little for the Lord-Gerdner's talents. He existed a while as a strange oddity at the Nihilakh court, the lords he served having no interest in the raising of new, verdant palace grounds. Depressed and despondent, instead of entering the Great Sleep with the rest of his species, Amontekh decided to wander the galaxy carrying little more than his ceremonial staff of office and a bag of seeds. Hoping that somewhere he might find a renewed meaning to his existence. Not even Amontkh can remember all the places he has been. Innumerable worlds have been blessed with his arts and there are many planets with unusual megaflora he has doubtlessly passed. Over the years he has reintroduced a great many different plants long thought lost to the universe as well as experimenting with new breeds which he will release into an environment to see if it takes hold in a cold and uncaring universe. Ever since the rise of humanity, Amontekh has lived among them, blending in amongst the masses either within stolen skin or pretending to be a loyal servitor. He finds humans fascinating and much reminiscent of the ancient Necrontyr, able to appreciate the beauty of nature when such miracles are presented to them. 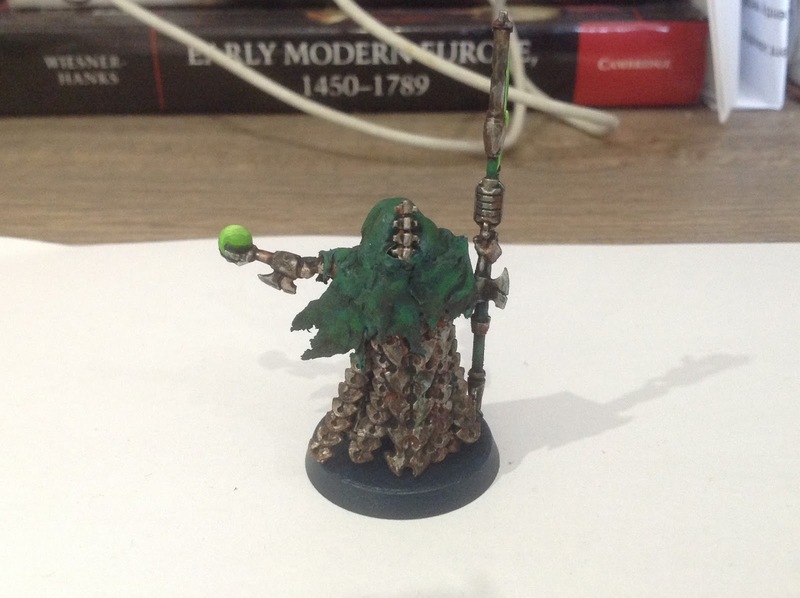 Known across the Imperium as the myth of 'The Green Man', or the 'Silent Gardner', Amontekh has recently attracted the attention of the Inquisitors attempting to ascertain the true nature of this mysterious wandering botanist. 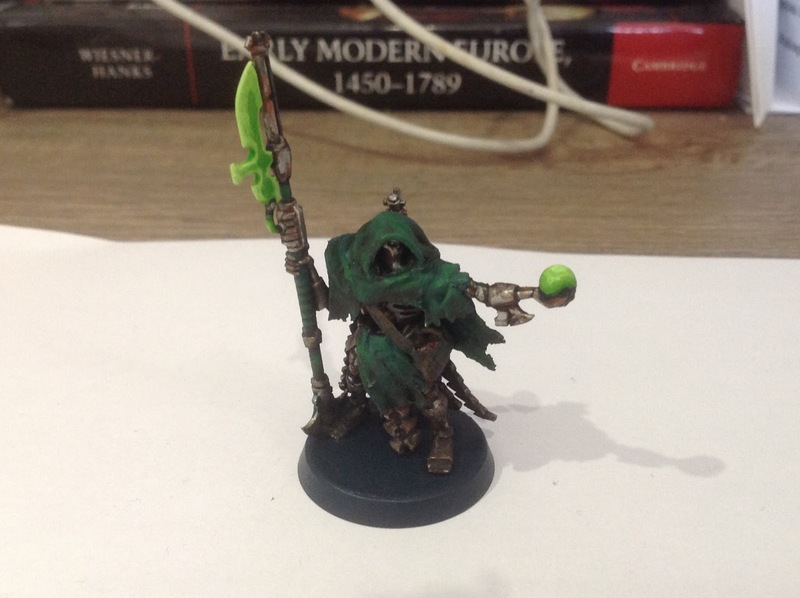 Not wishing to find himself on the wrong end of a boltgun the Necron has begun travelling with exploratory fleets and Rogue Traders on the edge of known space in order to keep his anonymity while searching out new life to add to his seed collection.